Turn almost anything at home into a smart device with Mother. Attach the “cookies” to whatever you want to track, and ask Mother to keep a watch. With accelerometers and thermometers in each cookie, the possibilities are almost endless. How you use Mother is entirely up to you. Dimensions: Mother: 6.3" x 3.5" D; Cookies: 2.25" x 1.15"
In the information age, data is life. How much? When? How often? 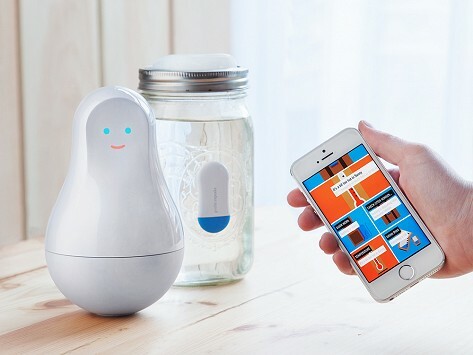 Thanks to Mother, you can now capture data about anything and everything in your home. Mother is a hub with “motion cookies” that will track everything from appliance use to opening doors to brushing teeth. The thumb drive-sized cookies have 3-axis accelerometers and temperature sensors that provide endless possibilities for collecting data. Attach the cookies to anything you want to track, and ask Mother to keep a watch. She’ll send data to your smartphone or computer, and will even notify you whenever a particular event happens. Use the cookies to measure activity or sleep quality, give you a call when a door is open, or send a text message when the basement is getting too cold for the pipes. Want to know whether a loved one has taken their medication? Need a reminder of when to water the plants? Want to see how long your kids are brushing their teeth? However you want to use this handy home monitor, Mother’s got it covered.